Our artists are the perfect idea for that party that needs that something else to set it apart from other parties your guests have been to. We can draw single or couple sittings. Color or black and white can be provided for your guests to take home and have an immediate souvenir of that event that they will recall time after time in the future. If it is a special project that you need to have done perhaps, for that great boss who is leaving the company, or an award for great achievement; we will create, frame and border your project for you with the custom specifications you provide. Most people love caricatures. Make your guests really feel special! They will be surprised that in just a few minutes they can take home a memory of the evening with any theme they choose included in the artwork. Of all the caricature artists I’ve seen in all my travels around the world, Kourosh is by far the best! Please accept the thanks of the Office of Student Activities for your recent visit to our campus. It was a real pleasure to have you return to Sewanee: The University of the South for yet another year. Our established track record with you, dating back annually to 1992 is quite remarkable. You are one of the constants in our yearly calendar. Our students appreciate your engaging presence and perception for picking up on aspects of their personality or hobbies that you are then able to include in their picture. From the office perspective, we are very pleased with how easy the process is to get on your calendar and bring you into campus. I wish all of our performers were as easy to get along with and take care of during the course of your visit. You are one of the most gracious spirits that I have encountered professionally. Thank you for sharing your talents and observations with our students for so many years! We look forward to your return in the fall of 2007. In an entertainment world full of options and inherent risks, the decision to bring you back to campus year after year is an easy one to make. There have been very few times in my professional life when I have been so pleased with a project that I have been compelled to write and express my appreciation and this is one of those rare moments. The caricatures you have drawn at Bone’s are exceptional. Your artistic ability is applauded by our customers and by all of us here at the restaurant. And, your dependability and cooperation in the scheduling of the caricatures is very appreciated. Thank you for helping to make things run so smoothly. I would also like to take this opportunity to thank you for your assistance with our varied projects from sugar packets to birthday cards. I look forward to the completion of our current Trotters project and to our continued association. 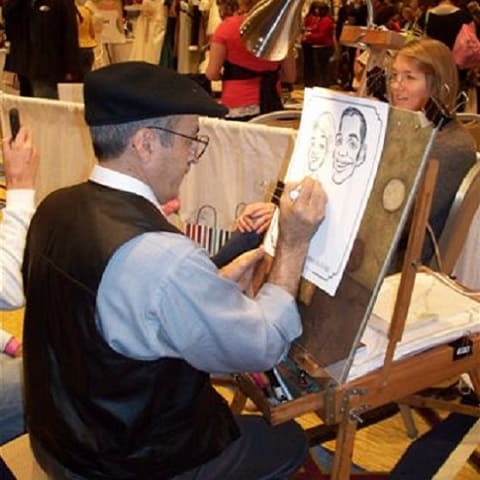 Kourosh Solaimani has done Caricatures on the mall here at Tysons Corner Center for the past four or five Christmases. Our customers, merchants, and management have been very pleased with his work. He has maintained a neat appearance and has had an extremely fine rapport with the customers. We would definitely like to see him return to Tysons Corner Center for future Christmases. You are a very talented guy and thank you so much for the nice drawing. If I can be of any help, please let me know. This is to thank you again for coming and contributing so much to the festivities of our office Christmas party. Our employees were very impressed with your talent and so highly pleased with the gifts of their own faces done in your inimitable style. You were very pleasant, patient and cooperative. With what appeared to be little effort and in an unbelievable space of time, you produced amazing likenesses of our people, reflecting to an uncanny degree the character of each. They loved your work. We are pleased to recommend your caricatures to all. Our Association had the opportunity to employ Kourosh Solaimani as a character artist for our Christmas Party. It was the best decision we have made for entertainment in a long time. Mr. Solaimani was hired for two hours, however, everyone enjoyed his work so much, we kept him for five hours. His personality, skill and professionalism make him one of the best. I am sure we will be utilizing his work again in the near future. Your talents and time were very much appreciated by our residents here at North side Convalescent Center. In only 8 minutes you created a caricature which the families and residents will cherish for many years to come. The way you combined physical features and hobbies of certain people here created more than just a photograph. We could have kept you here for hours and the people here would have enjoyed every minute. I hope that we will again be able to have you at North side Convalescent Center. Thanks again! We can’t thank you enough for your creative abilities and sense of humor. We have received such rave reviews from our associates about your work. As you could tell from the lines, you were a huge success. Thank you again for being a part of our Holiday party. We hope to have you at our events in the future. Patrick is the only caricaturist I use and has been since 1985. Patrick is a remarkable talent. His caricatures were the hit of the party. I use mine on my personal stationery. Your caricature occupies a place of honor in my home. Thank you for the caricature, Patrick. I love it. It has been our pleasure to have Kourosh at our annual buying show. His caricatures have become an annual tradition. We look forward to have Kourosh at our 1987 Annual Buying Show. Your work for us in the past has always been extremely creative and original and has truly been a highlight to any function for the company. You have a true talent in expressing your subject’s personality into your art. It is always a pleasure to work with you and I look forward to having you join us again in the near future. I just wanted to let you know that it was a Big Hit. They all LOVED the drawing! Enclosed is a picture which was taken at Brian’s Bar Mitzvah. We hope that this will be useful to you and perhaps your scrapbook when you try to obtain additional jobs. You may note that it has been almost a year since the Bar Mitzvah until we obtained the pictures, and it is just as consistent with the fact of how long it takes us to get things done perfectly. Again, thank you very much for your helping to make Brian’s Bar Mitzvah the success that it was and please reserve two years from now for younger son Paul’s Bar Mitzvah. Your flattering portrait of me was forwarded by Governor Godwin’s office in Richmond. It was very thoughtful of you to do this and I appreciate it. You obviously have great talent and I want to wish you every success. Just a short letter to thank you for your presence and work I at our Christmas Party on December 14, 1985. Everyone was thrilled with their pictures and your professionalism. Your flattering portrait of me was forwarded by Governor Godwin’s office in Richmond. It was very thoughtful of you to do this and I appreciate it. You obviously have great talent and I want to wish you every success. Last year I had the good fortune to meet Kourosh at a Craft’s Fair in the North Georgia Mountains. I was so impressed by his artistic talents that I asked him to work on a surgical project with me. He came to the Operating Room at the Baldwin County Hospital in Milledgeville and was shown our gastric bypass operation for morbid obesity. A number of gastric bypass papers, booklets, and lectures were being prepared that needed illustrating. Mr. Solaimani, in a very ingenious manner, was able to take the flavor of what we were doing and translate it into very informative and provocative caricatures. Mr. Solaimani is an intelligent, honest, and extremely talented person. I recommend him without reservation. Caricatures were drawn for a large office party. The client was extremely pleased with the results. Caricatures were drawn on full-color, pre-printed paper to promote the South Korean company Hanwha Solar during a Giants baseball game at the AT&T Park in San Francisco. These 50 caricatures were part of a series that were given as gifts to guest speakers for the Rotary Club. -Mark Barbour, President of Marietta Rotary Club.